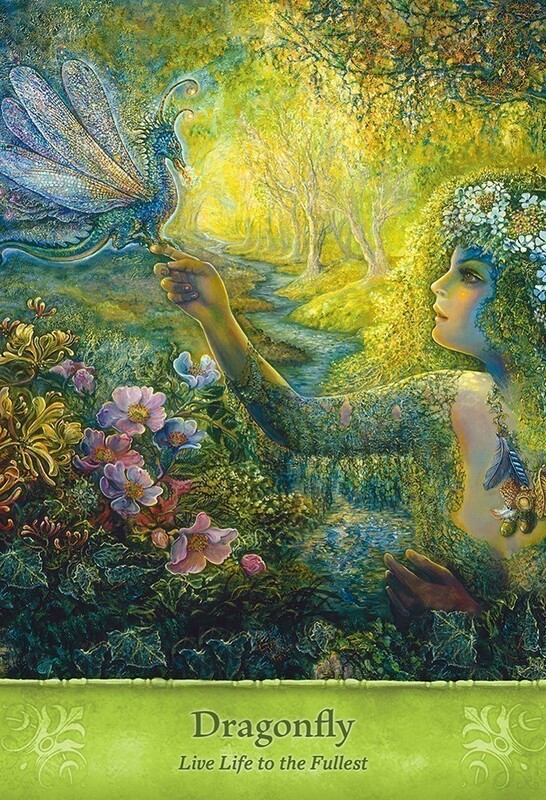 Featuring the enchanting artwork of Josephine Wall, the Mystical Wisdom Deck provides guidance for the present and inspiration for the future. Archangels, goddesses, spirit animals, fairies and wonderful, mystical creatures deliver uplifting messages and gentle advice to help you get past all of life’s challenges and get back to joy! 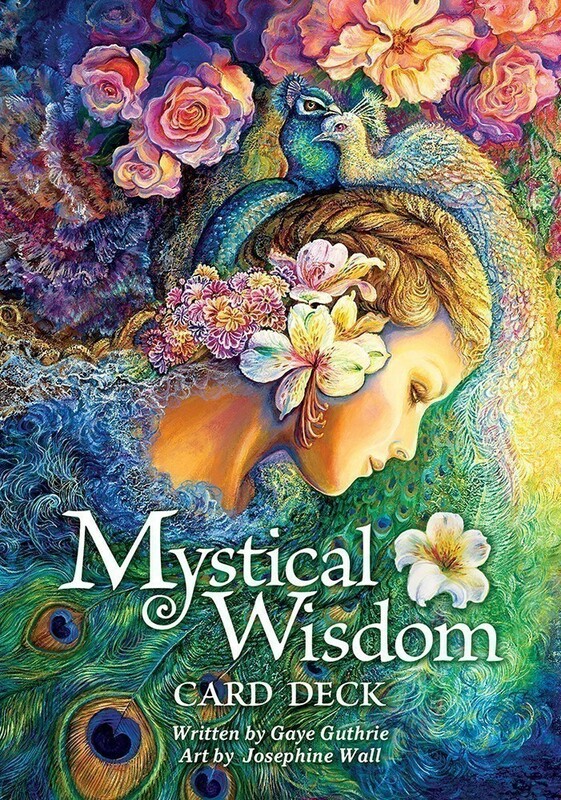 The Mystical Wisdom Deck includes 46 cards with a 64-page illustrated guidebook full of hope and wisdom. The Mystical Wisdom deck is a treasure of an oracle. 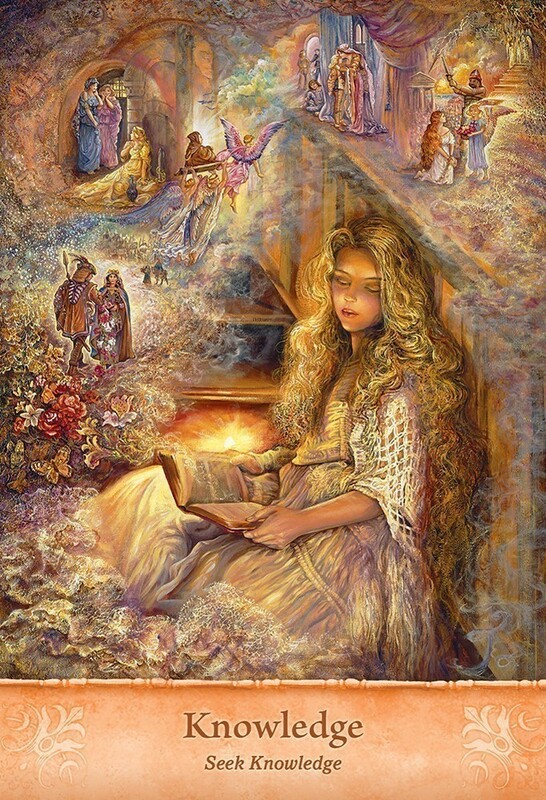 Josephine Wall is a favorite fantasy artist of mine. 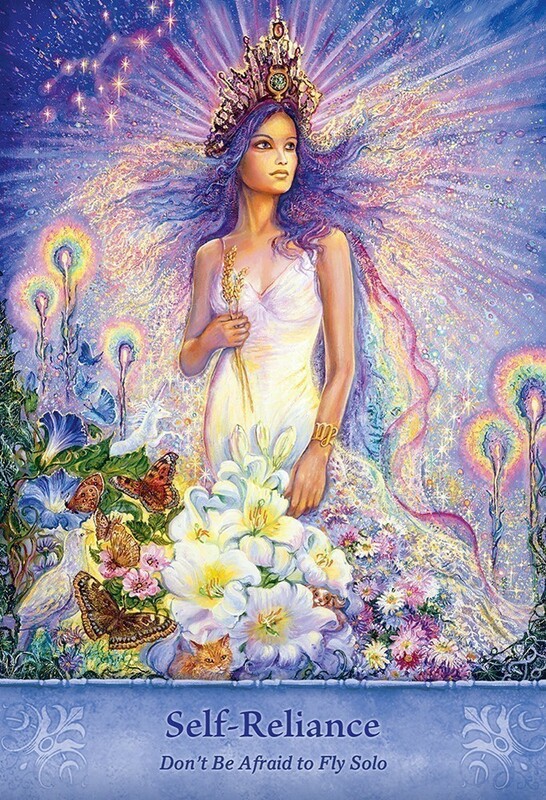 Her works are beautiful, soothing, inspiring, and wonderful for divination. The more you look at each work, the more details you see. U.S. Games has done a spectacular job taking these incredible pieces of art and making them into a deck. The first thing you notice is the sturdy box, with the full color design that U.S. Games does so well. The cards are oversized, just enough to give you the full effect of the intricate details of the art, but still comfortable to handle and shuffle. They chose to leave off borders which also suits the art work very well. You feel drawn into the images, as if your vision goes on beyond the cards (as well it should). The card stock is perfect; you won't get curling with use. The back of the cards are a dreamy soft pink and yellow design, reversible except for the publishers stamp. The booklet is sturdy as well, with a beautiful full color cover. This will most certainly hold up over time. There were no corners cut in the publishing of this deck, and I think that the high quality shows a great deal of respect for the art. The cards are a collection of arch angels, animal spirits, advice and inspiration. The book is written by Gaye Guthrie, and she does a wonderful job of taking you deep into each card and drawing out it's mystical significance. She notes in the introductory paragraphs that "The purpose of the Mystical Wisdom cards is not to endorse fear of the unknown, but to inspire and uplift you by bringing peace and comfort when times are challenging and also at times when life is joyful." This is a deck you can trust to guide you in hard times. It will offer comfort, hope and advice. I know I will be turning to it in the future both for myself and my clients. I definitely recommend buying a copy of this deck; I really feel that it will hold it's value both as a collector's item and as a useful divination tool and accompaniment. Using the word “Mystical” or “Mystic” in the name of a product pretty much ensures that I will want to take a close look at it. 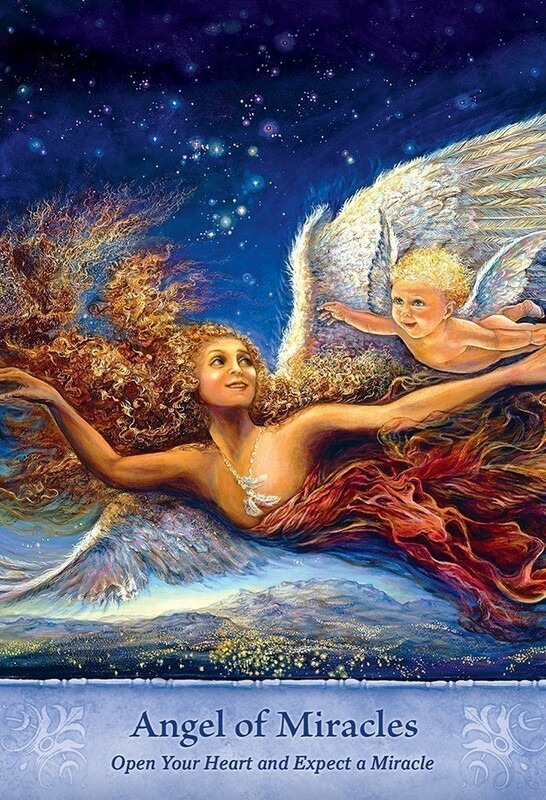 I’m not big on “Angel” oracles, so I was delighted to see that in addition to angelic influences, the creators of the Mystical Wisdom card deck incorporated gods, goddesses, fairies, and animal spirit guides. I’m also not a big fan of saccharine messages and affirmations, especially when paired with airy-fairy art that is somehow supposed to make everything okay (it doesn’t), so I am pleased to note that the Mystical Wisdom cards (while certainly inspirational and uplifting) allow for awareness and exploration of life’s complexities. 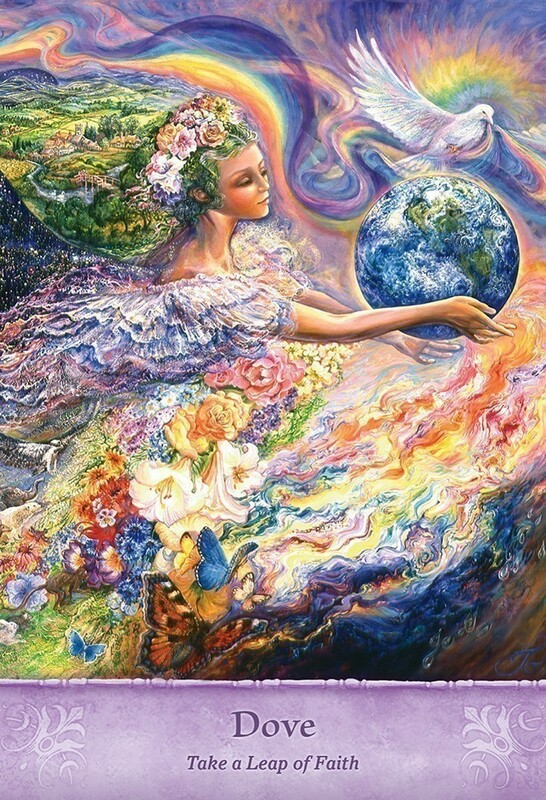 Josephine Wall’s artwork is gorgeous and so much more than “a pretty face.” Each card provides a wealth of detail, color, and imagination. From the rich, moody purple, blue, and indigo of the “Moving Forward” card to the cheery gold, yellow, and green of the “Vacation” card, Wall uses her palette with great skill, weaving into each image a story worth meditating upon. This deck is a wonderful choice for a daily card draw – either for inspiration or to answer a specific question. The deck creators also suggest a 3-card spread that would cover the beginning of the week, the middle of the week, and the end of the week. The deck also works well with Past-Present-Future-Outcome readings and the Celtic Cross. The artwork on these cards is spectacular. I am attracted to the beautiful colors throughout each card as well as the activity portrayed. These cards are conveniently easy to dictate as they reveal their potential meanings at the base of each card...allowing for an initital interpretation, while the "activity" of the card enables further dictation on a more personal level. I use these on myself and with clients. These are one of my favorite decks to work with as I have entrained myself with them for more accurate readings. I have used many other decks that I never connected with. This deck contains high female energies, but the colors and activities allow for male energies as well. I have been using the Mystical Wisdom deck for 4 months and I will continue to use them as my go-to deck when I am drawn to do a reading for a client or myself. The cards are borderless on three sides (yay!) with bottom borders of various colors throughout the deck. The bottom border features the card name and key phrase. The backs are a soft antiquated pink/purple with a reversible design. There is a copyright marking on the lower right edge of the backs, so they are not entirely reversible. The cards are not glossy, but there is a slight sheen to them in the light. The cards and booklet are housed in a strong and sturdy cardboard box with cutouts for ease in lifting the top off. The illustrations are very intricate, colorful and busy. When first going through the deck, I thought it was going to be way too chaotic for me to read with. And I still can't see myself using this deck for big multi-card spreads for this reason. But for single card pulls or very small layouts, the amount of detail in each card is wonderful. Some of the cards are less busy than others, but most of them have a lot going on. So for a single question, there are so many places for your intuitive eye to fall on. There are many layers to the answers you will receive. The beautiful illustrations and colors transport you into another world. A surreal place where your intuition can work wonders if you let it roam free. This deck is beautiful, but it is so much more than that. There are surprises at every turn in the imagery. I am delighted with the sheer magnitude of variety in the illustrations. The cards have an energy that I was able to click with effortlessly. If there is something specific I am dealing with, the cards will address that exact situation with guidance that, when followed, always leads to my highest good. If it is a day with not much going on, it will give me a general piece of advice that lifts me up and makes me a better version of myself. 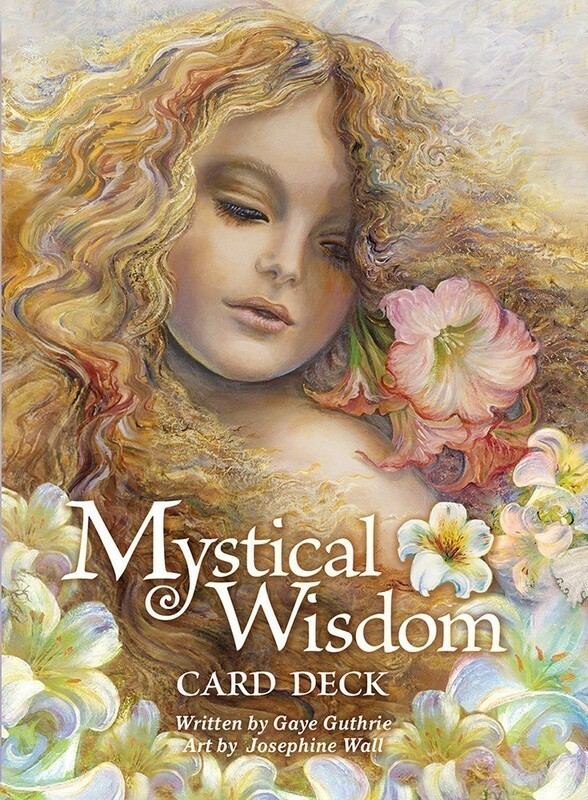 The Mystical Wisdom Card Deck is a lovely collection of artwork by renowned artist, Josephine Wall. It is ideal for beginners because it does not contain any images that some may find frightening or upsetting. The images have a healing vibration to them and are soothing to the psyche. The card spreads are very simple to use and there are simple explanations included in the guidebook as to how to use the card spreads. All of these factors combined make The Mystical Wisdom Card Deck an ideal deck for beginners. I also consider this deck to be suitable for children who may be interested in exercising their intuitive muscles. I have just begun to use the card images for meditation. 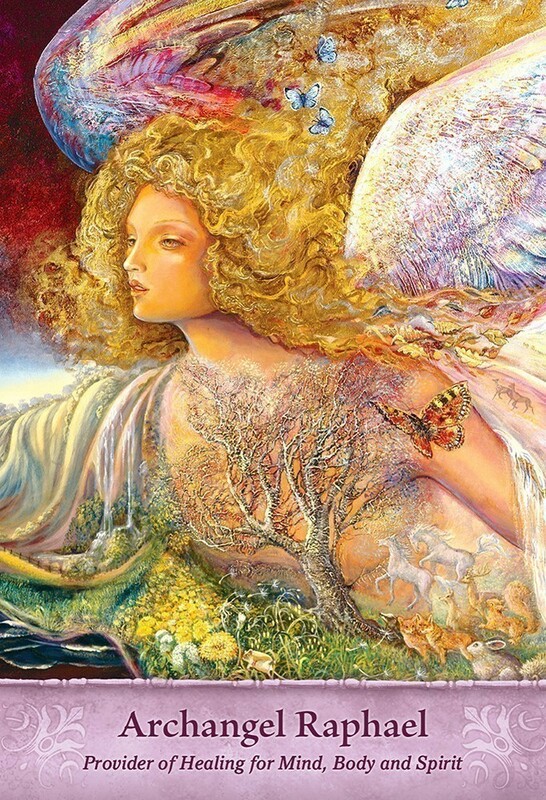 Josephine Wall’s art is so intricate that your eyes will not get bored as you center yourself and examine the same card image for a few minutes. 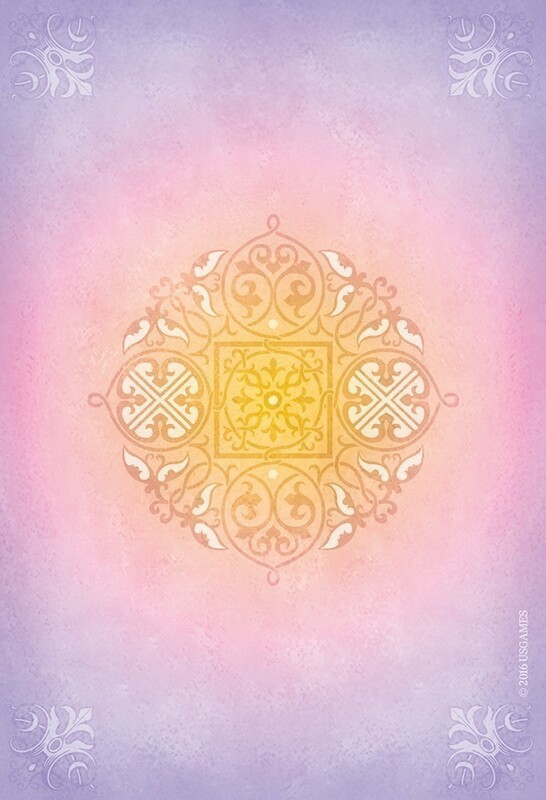 The card images of The Mystical Wisdom Card Deck lend themselves easily to meditation. I also feel that with proper focus, intention and use of the included mantras they can be used as an additional tool for spell work for those of you who are practitioners.